It’s so true…anyone who’s spent time in an elementary school classroom knows students start with endless imagination, curiosity, and lots of creativity…that is, until they learn how best to answer the question (versus asking the thoughtful question). Our students, considered digital natives, spend more time on devices today (even IN our classrooms) than not. When they are not in our classrooms, they are still “going to school”—just on the Internet. So how do we create innovators in our school setting everyday? 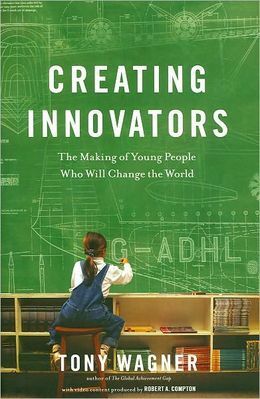 In his book, Creating Innovators, Tony Wagner explores what parents, teachers, and employers in the 21st Century should do to develop the capacity within our youth to become innovators. Adults in a child’s life are the first ones to nurture creativity and spark imagination while teaching the child how to persevere and learn from failure. There are patterns developed in childhood creative play leading to special interests and deeper purpose for career and life goals. Play, passion, and purpose, he concedes, are the driving forces for young innovators. I’ve challenged our classroom leaders to read this book as a pipeline for creative talent, taking note of the ideas that might create change in their learning environments through play, passion, and purpose. My personal thoughts on parenting, education, and mentoring have changed in quite profound ways from studying these innovators. This generation of learners/innovators lives in a radically different world than we did growing up…global economy, connectivity, and strong competition being just a few of the drastic differences. As one of my teachers noted during our conversation about this book the other day, “I’m not teaching a subject anymore; I’m here to teach a process for learning that will follow them always…how to successfully teach themselves.” 🙂 Learning to learn with the daily explosion of technology available brings new meaning to “lifelong learner.” Tony Wagner is right: “What makes this generation of innovators unique, and what ultimately give me faith about their future, is that no matter what they encounter in life, they will find a way to figure it out.” Here’s hoping we do our personal best to foster innovation daily! This entry was posted in Personal Reflections and tagged creativity, innovation. Bookmark the permalink.